When I first started working with Marcia-the-Mentor, I was astonished at how much she’d do to a piece of silk before she called it finished. Now she’s got me doing it. This started out as a pink scarf that I overdyed with purple. I used soy wax and batiked leaf shapes over it, then dyed it a darker purple. I gave it a warm bath in thiox and as the pink and purple were removed, the scarf became pale orange and beige. 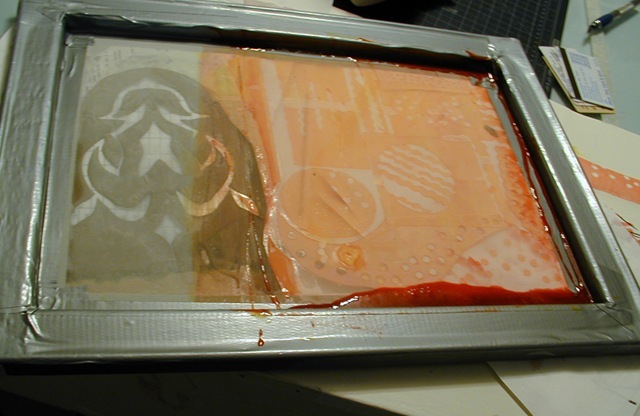 I cut some shapes out of clear contact paper and stuck these to a blank silk screen. Using Procion MX dyes thickened with sodium alginate, I made a dye paste to use on the silkscreen and made three color passes over the entire scarf: one yellow, one orange, one a very greyed-out purple. I just listed this piece at my Etsy shop. To the left is the screen I used. I blocked off one side with paper and duct tape and used only half the screen at a time. I later used the larger shape on the left of the screen to use the same process on another silk scarf I wasn’t happy with, pictured below and listed at my shop on 1000Markets. This one was done in cooler shades, using the same greyed-out purple dye as well as a yellow-bronze color, and just a touch of pink. Both of these scarves feel wonderful; I think the hand of the silk softened with each process, although it’s still as strong as ever. As always, they’re colorfast so you can handwash them in the silk with a little Woolite, or by machine on the gentle cycle. Drip dry, then touch up with an iron. Entry filed under: All Posts, latest projects, processes in silk painting / surface design. Tags: Althea Peregrine, AltheaP, charmeuse, Janine Maves, scarf, shawl, silk painting, silk screen, surface design, textiles. Yours silks are just georgous! So elegant and rich looking! It is hard to figure out when to keep working on a project and when to throw up your hands and call it a learning experience – these are so beautiful I am glad you keep on working through the first phases! Sounds like your mentor is a gem.